At exactly 11 a.m. on Nov. 8, a Glossier sweatshirt-clad employee beckoned me toward a heavenly skylit and red carpeted staircase that led me upstairs. I felt as though I was floating as I sprinted up to the retail space on the second floor. Immediately, my eyes met with Glossier’s signature millennial pink color scheme and elaborate flower arrangements. The products were laid out neatly on various counters, with a myriad of brightly lit mirrors that lent themselves to both product testing and selfie-taking. 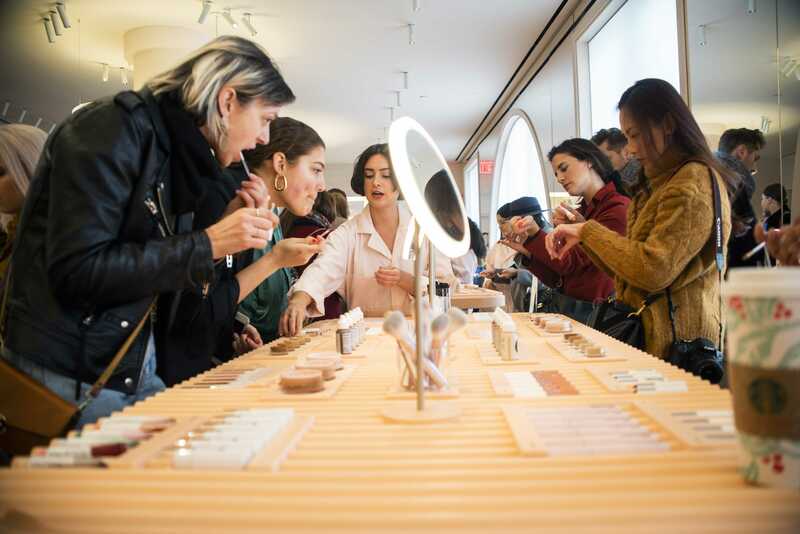 Smiling sales associates — or as Glossier prefers to call them — showroom editors, were eager and ready to answer any questions customers had. As a matter of fact, their interactions with customers seemed more informed by a sense of friendship than salesmanship. 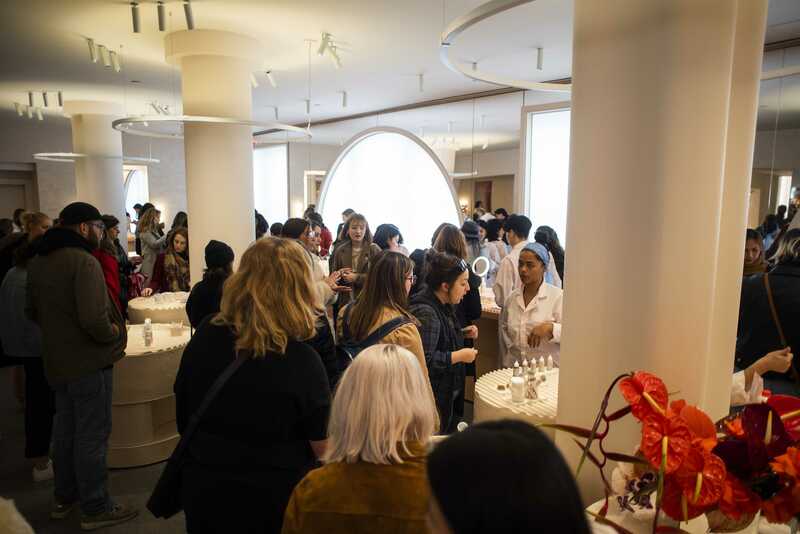 When Glossier announced on its Instagram page that they were opening a two-story permanent flagship store at its iconic address, 123 Lafayette St., (formerly home to its holy penthouse showroom), I knew I had to be first in line. I arrived an hour and a half before opening. The line grew behind me, anticipation growing. The blurry and mysterious movement behind the frosted windows of the elegant, off-white storefront only added to the excitement. 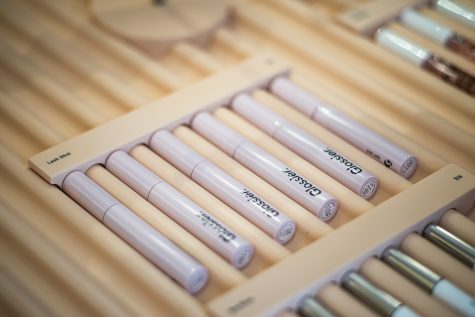 In this space, customers can try illuminating their cheekbones with the crystal-infused Haloscope, enhancing their lashes with the highly anticipated Lash Slick, or finger painting on their own cheeks with the sunset-colored Cloud Paints. I chose to spend most of my time with the new line of Generation G lipsticks, which were making their in-store debut. I loved the newer, sturdier packaging and more moisturizing formula so much that I purchased three of the six beloved shades on the spot. A nice touch to the main showcasing area is the presence of a red couch along one of the walls, a fixture the average not-so-enthused tag-along visitor, such as the Glossier Boyfriend, is likely to appreciate. Moving deeper into the millennial haven, I found myself in the wet room — a room fully equipped with working sinks, plenty of skincare products to test and the kind of bathroom lighting one imagines graces Gwyneth Paltrow’s visage each morning. Visitors could choose to try out the Moisturizing Moon Mask, or perhaps Glossier’s rendition of the chemical exfoliant, Solution. But what’s even more exciting than the innovative wet room is the “Boy Brow Room.” As the name suggests, it’s a room wholly dedicated to the celebration of Glossier’s most in-demand product: the Boy Brow. In fact, at one point, there was a waitlist about 30,000 customers long to buy the brow enhancer. Having tried it myself, I can testify to its excellence, and am tempted to say it’s the only boy you’ll ever need. The room itself features human-size models of the eyebrow gel that Showroom Editors encourage one take multiple selfies with. It goes without saying that every angle of the entire store is Instagram-worthy. Consequently, almost every customer, myself included, wandered the rooms with their phones out, documenting the full experience and sharing the content with hordes of envious followers. The Glossier team posted videos on its Instagram story as well, including one of myself racing up the stairs as the store opened. The founder, CEO and NYU alumna, Emily Weiss, reposted my Instagram story to her 415,000 followers. 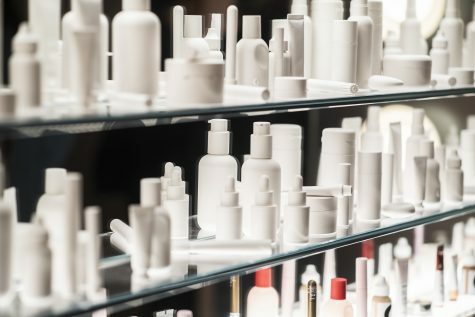 Glossier has created an immersive and interactive masterpiece that seems to transcend the average retail experience. 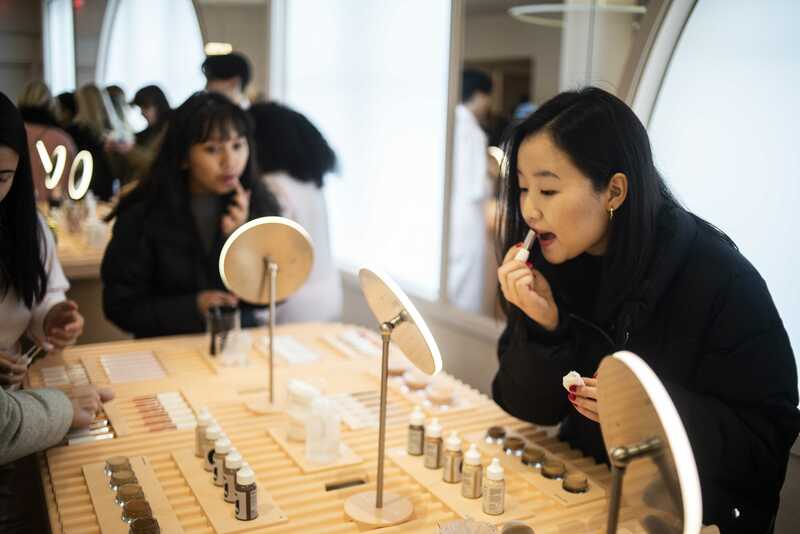 It extends beyond just the purchasing of a product — the company has created the ultimate beauty destination that provides so much more than just serums and tonics. Everyone who visits will walk out enamored with the company if they weren’t already, proudly clutching at least one of those distinctive pink bubble-wrap pouches.